I live in the Sausage Capital of Texas. Little Elgin, now basically a suburb of Austin with a strong rural feel, is a railroad town in a part of Texas heavy with German immigrants. With the immigrants came the sausage Elgin is famous for and of course, sauerkraut. 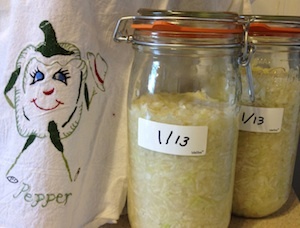 Now, I can safely say I’d never really had sauerkraut before I started making it myself :-). All I’d ever tasted was that canned stuff 60’s housewives used to buy for wiener roasts on hot Saturday afternoons. Always hated that stuff. So you may wonder why I ever decided to go thru the trouble to make sauerkraut the old-fashioned way after that experience. Two reasons really, I found out that making sauerkraut is easy and that it is remarkably good for you. In many places in the world sauerkraut is regarded as a miracle food. It was a very important food to the settlers here in Central Texas. At the living history museum near us I learned that one of the first things the settlers did was get the cabbage in the ground and make sauerkraut! I wondered why this was so important in our temperate climate. Now I know that sauerkraut was a culturally important food regarded as vital to good health. So it wasn’t just the love of the flavors that drove them, but concern for health. Fermented foods like sauerkraut are living foods meaning they packed with a wide range of beneficial live bacteria are absolutely necessary to the digestive process. A healthy gut is loaded with these helpful little guys, predigesting foods and manufacturing vitamins in the process. The fermentation process increases vitamins especially vitamin C and all the B vitamins, making sauerkraut an excellent source of pretty much all the water soluble vitamins. 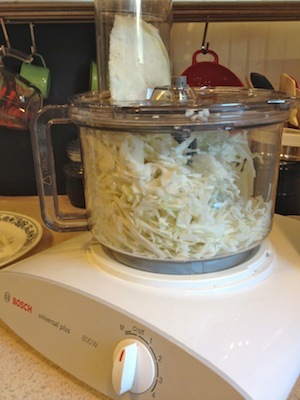 To make sauerkraut you only have to have three things: a cabbage, a crock or jar, and some salt. That’s it! So very easy! You might think there is no way to complicate this but you’d be wrong ;-). Last year a controversy broke out on the internet over exactly what kind of jar to use for ferments. At the time I hadn’t done a lot with ferments and so didn’t have much of an opinion. I did know that I’d tried open crocks and mason jars without a lot of success. I also tried the Pickl-it. I was becoming discouraged. And the controversy raged on. It seemed everyone had a strong preference. But what was working for everyone else wasn’t working for me. Now, don’t get me wrong, I think these methods can yield good results in the hands of an attentive soul. That just isn’t me :-). I’d forget to skim the top or refill the little reservoir in the air-lock and boom, my ferment went bad. And I got some smelly ferments, let me tell ya. I live in a climate that is very hot 5-6 months out of the year and just plain warm another 4 months. So I found it tricky to keep my ferments cool, skimmed and topped up. 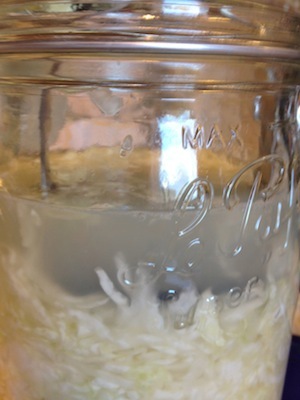 Just as I was becoming truly bewildered at my lack of success, Lea over at Nourishing Treasures wrote an excellent series called Sauerkraut Survivor where she tested a very wide variety of jars. She even had a good microscope with which she could view the microscopic results of her experiment. And she included the fido jar in her test. Now, I didn’t have the money to buy a lot of special equipment for this like harsch type crocks or extra Pickl-its. I already have a sizeable collection of fido jars though and had wondered how they would work as fermentation vessels. No one seemed to talk about them much, so I didn’t know. Then Lea began to write about how impressed she was with the results from the fido. Good flavor, excellent bacterial content and nearly fool-proof to use. Perfect! Since then I’ve been using Fidos exclusively. While plain jars or crocks yield great results for many, they just weren’t working for me. The Fido and Le Parfait wire bail jars were my answer to making fermenting an easy process for me. And they are what makes this sauerkraut recipe super easy to do. If you don’t have a Fido or Le Parfait jar don’t worry … I give instructions for other jars too 🙂. Peel the outer leaves off your cabbage first. Then if you have to slice the cabbage to fit in the feeder. If not, then slice the cabbage into thin sections. 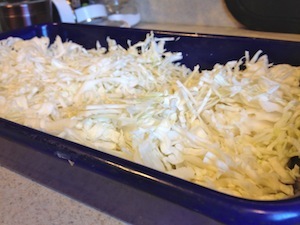 Put the sliced cabbage in a roasting pan or a large bowl. Add the salt. Then stomp the cabbage till it is limp and juicy. This part takes about 5 minutes or so. 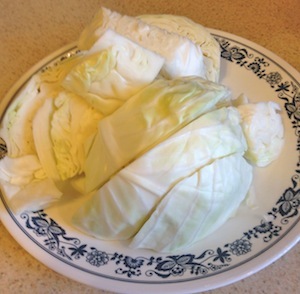 Put the cabbage in the jar and pack it down till it’s totally covered with cabbage juice. Optional step: Add 1 Tbsp of whey to your jar. While not strictly necessary I like doing this to help ensure a high LAB (lactic acid bacteria) bacteria content. For Fido-Le Parfait jar users: The next step I take is a little controversial, I think. Since I’m using a Fido or Le Parfait jar I don’t worry to much about the water level in my jar and I don’t use a weight. If you’d like to understand why I refer you to Nourishing Treasures excellent post on how well this worked in her experiment. If you’d prefer to be less edgy simply place a weight in your fido to ensure all the cabbage stays under the brine or be very careful to pack the cabbage down well. Leave the jar out a minimum of 7 days. Most folks recommend moving your jar to the fridge at about 3-4 weeks, but I’ve been leaving mine out about 2 months with good results. Again, with that edgy thing :-). Use your judgement and decide what you feel comfortable with. For other jar types: Add a weight to your jar if you are having trouble keeping your cabbage under water. Put the lid on and leave the jar out a minimum of 7 days. The jar needs to be checked periodically for scum. Skim any you find. Most folks recommend moving your jar to the fridge at about 3-4 weeks and with anything other than Fido/Le Parfait or an airlock system jar I myself would go to the fridge in that timeframe. Make sure you have lots of cabbage juice on top. Put on your counter or in a cabinet . Lacto-Fermentation – Good overview of lacto-fermentation and it’s benefits by Sally Fallon and Mary Enig, PhD.